Bangkok is one of my favourite places in the world. I love the energy, the food, the people, the shopping, the sites – everything really. It turns out I even enjoyed a popular Bangkok scam – the gem scam. 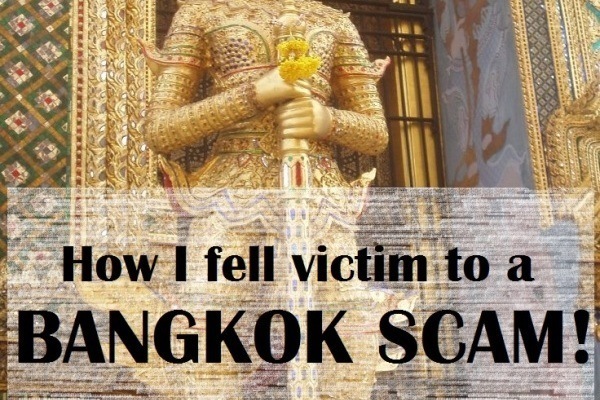 How I fell victim to a Bangkok scam! The first time I went to Bangkok, I didn’t know anything about this scam. In fact, I didn’t really know much about Bangkok. What I did know, was that I wanted to visit the Grand Palace. Bangkok was the first stop of a very busy 6 week, round the world adventure. We only had a quick 24 hour stopover on our way to Egypt, so we headed there first thing in the morning. It was a bit of an adventure to get to the Grand Palace. 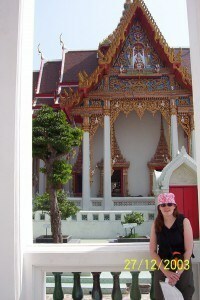 We caught a ferry along the Chao Phraya with the locals and made our way to the Temple of the Reclining Buddha. It was amazing, and we were excited to move onto the Grand Palace. I was nowhere near as travel savvy back then as I am now, and when we were stopped by an old man on the way who said he was a teacher and told us that the Grand Palace was shut for most of the day, we believed him. He told us we should visit some other temples which he drew on our map. At the end, he also drew on a gem shop – “Thai Export Jewellers” – for if we had time at the end. He then stopped a passing tuk tuk, talked to the driver and gave us little option but to go with his suggestions. This was the beginning of our Bangkok scam. It was my first time on a tuk tuk, and I loved it. It was exciting. I was a bit apprehensive about where we were going, but mostly I thought it was lucky that something was working out since the Grand Palace was shut. The first stop was at a pretty temple by the river. We loved it, especially because there weren’t other tourists there. When we went inside the temple, another Thai guy started chatting to us. He told us that we were at the temple of the lucky Buddha and that people came here to ask for good luck in their travels! So we preyed for good luck. He also happened to mention the Thai Export Jewellers, and how he goes to London for school and takes over something from that jewellers shop before he goes, tax free, to resell in London to make money. The “helpful” man who said he was taking gems back to London is on the left. What a coincidence that he should mention London as we were flying there that night for a 12 hour transit on our way to Egypt. I can’t remember if we mentioned we were going there to the first guy or not, but I guess we must have. Anyway, the “coincidence” of both people mentioning it was too much and off we went to the gem shop. I was not completely gullible. I don’t believe there is any such thing as a free lunch, so I did not believe that we would make money from reselling the gems over in London. I did think perhaps we might get something nice for a good price though, and it couldn’t do any harm looking. It was a nice gem shop, and they went the big sell. I ended up buying a ring for myself. My travelling companion bought something too. I thought for his mother, although he told me later it was to resell when we got home. If he was successful in this, I don’t know. I imagine not. This was the point of this Bangkok scam. They needed to resize the ring, and while this was happening, we visited the other two temples that the man had put on our map and enjoyed them as well. After we picked up the ring, the tuk tuk driver dropped us off at a canal to get a river taxi to Siam Square. Unfortunately, first of all he took us to one of those duty free shops they all want to take you in Bangkok. I argued and argued against this, but it was no use. I did pay him less because of it though. The boat ride to Siam Square was absolutely awesome. Full of local people and kind of peaceful. It was the highlight of my day and not something I would have found by myself. We then caught the skytrain to the weekend market and did some shopping. We finished off our day in Bangkok with some shopping at the night market in Patong before heading back to the airport. It was an awesome day! I have visited Bangkok many times since, and although I have always loved it, no day compares to this first day I had in this wonderful city. I enjoyed going to the lesser visited temples and using all the different forms of transport. I love my ring – I still wear it today!! $60 for nearly ten years constant use is a bargain in my opinion. As for this Bangkok scam, I believe it still continues today. I know every time I have been to the Grand Palace, people have tried to tell me that it’s shut, but I tell them that they are lying now and keep walking.They sucked me in well enough that I didn’t know it was a scam until someone told me and I did an internet search and lots of results came up. It is definitely well executed, and they no doubt fool many people. At least in part anyway. It was very difficult to believe that we were going to make thousands by reselling their gems, yet everybody wasn’t onto it and doing it themselves. All in all, I am very happy that I was a victim of this Bangkok scam. If we had just walked into the Grand Palace, I would never have had such a great day. It seems that sometimes being scammed is a good thing! The moral to this story is that travel often doesn’t work out the way that you expect – sometimes, it can work out even better. Enjoy the ride! 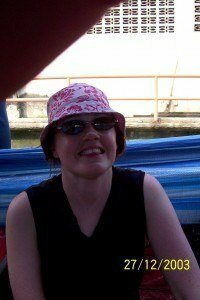 Next week, this Flashback Friday series will continue with the next stop on this round the world adventure – my disappointing visit to the Giza Pyramids. You can read about more travel scams here. You can also read our full guide to Bangkok. How about you, have you fallen victim to a scam? Did it turn out to be a good thing? I had a very similar experience! And I enjoyed myself too. I managed to not buy anything. If you’re going to get scammed this is probably not the worst that could happen. It’s hard to even imagine such a brazen scam – but it would all sound very reasonable as it’s happening. At least you got a ring and a story out of it – not a bad deal! Yeah it wasn’t a bad deal at all!! I’ve had people criticise my ring over the years when I’ve told them the story – once they hear its background they carry on how it must be made of crap materials, but does it really matter?! I love it and it still looks great! We were also approached by a tuk tuk driver that told us the Grand Palace was closed until later and offered to take us to a number of places. My husband fell for it, even when I had warned him about the scam, but I pulled him away and we visited the very open Grand Palace. It definitely still happens. The first time I visited Bangkok about 15 years ago I was on my way to the Grand Palace when this Thai guy started chatting about football. Wanted to know what team I supported, told me about his team, knew all the players, seemed very genuine. Took a while to get around to telling me that the Grand Palace was shut and that I should try another temple that was better anyway. And then called his friend, who happened to be a tuk tuk driver. As we weren’t far from the Grand Palace, I wanted to see for myself that it was shut. I don’t know why, but it just seemed unbelievable that such a place would shut. Then he really started to try to get us in the tuk tuk, so I knew something was up. So I told him I’d arrange to meet some friends there, so didn’t have a choice, but I’d be back. Obviously it was open when I got there. I later read in my guide book that Thai men often broke the ice with football talk before trying to scam you. Now if someone asks what football team I support, I’m always about to say… it’s ok I don’t need a tuk tuk. LOL. Lol I am a bit like that when it comes to cricket after going to India. I was ready to scream at the next person who asked me about Ricky Ponting!! Yup still happening today. We wanted to go to the mall and a “teacher” who had the day off told us it was shut and to come with him. We could see the mall across the road with people in it and thought what is he going on about and declined. Sure enough it was open. They are so nice it doesn’t even feel scamy until you think about it lol. We got a slightly different scam in Bangkok – they were trying to sell gems for more money than we had to both our names AND our combined credit limits. Glad we didn’t buy that one! $60 for a fun day out isn’t too bad. At those prices they actually earn their wage anyway! This is a famous scam in Bangkok. And the “gem shop” you visited probably sold fakes. The Grand Palace is never closed. That said, I too have enjoyed falling for some scams, like trying to get to the Pyramids from Cairo. After taking the metro to the Giza stop we were walking to find a taxi and met some friendly guy said he was an English teacher from Alexandria who was also going to the Pyramids and would show us how to get there. In we went to a share van and then into what was essentially a tuk tuk where we ended up at a shop (red flag) that was selling horse and camel tours of the pyramids. The guy bought us the best breakfast we had in Egypt and we just left without buying anything. They kept shouting after us about how the entrance to the Pyramids was a 5km walk (it was more like 3 minutes). So, not only did we get to the Pyramids for free, but we got an awesome breakfast too! My post next Friday is actually about all the hassle I had trying to see the pyramids!! I didn’t fall for any scams there, but perhaps it would have been better if I had as I did not enjoy my visit at all. Sounds like you were very lucky! I had a similar experience in Morocco, where at the end of the day they just bring you to shops were they get commission or shops from their family or so but to be honest it was a great day as well and I saw places which I otherwise would not have seen. Glad you had an awesome day. Sharon, this is a great story! Now I really wanna go over your itinerary for that day and visit the smaller temples. I watched Scam City before going to Bangkok, so I knew about this scam beforehand. I was really looking for these guys there because I thought it would be fun to see what they’d try to do haha we just wouldn’t buy the gems, though. Too bad nobody tried to approach us. lol typical that you didn’t see them when you wanted to! I really wish I knew exactly where I went that day. I have tried to replicate the experience but failed. I was saying to some friends yesterday, that I need to “fall” for the scam again next time I am in Bangkok so I can go back to these places!! I did have a similar kind of experience in Agra, India, where the Taj Mahal is… I somehow fell in with a tuk-tuk driver who wanted to take me all kinds of random places. I knew he was likely to take me somewhere at some point where there would be stuff to buy, but he also took me to some cool places I wouldn’t have found on my own. And then, when we did end up at the shop where they sell stuff inlaid with stones, I did buy some coasters. Sure, I probably paid too much, and I know he probably got a kick-back, but the coasters are beautiful and they continue to remind me of that experience. Thats really funny you should mention this. I didn’t know anything about it. 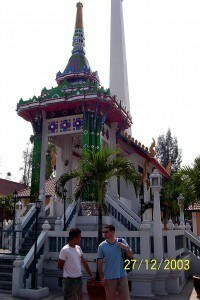 My Husband and I went to Bangkok in 2002, and arranged several tours through Tour East a local ground handler. We wanted to go to the Grand Palace but were also told it was closed. We did do some other awesome palaces though so weren’t too disappointed. However, we were also taken to a gem factory! I bought a beautiful sapphire ring which wasn’t very expensive. I have since had it valued and it is worth twice what I paid for it and I do love it so that’s not a problem. I had never heard of this scam though. I wonder if it still happens. Wow it does sound very similar. Now you have me wondering whether my ring is worth something!! It is crap that even a tour organiser is using the same lines though. I know people at least still hang out at the Grand Palace and say it’s shut. This happened to my family in Bangkok a year ago! I was so angry when I found out it was a scam, because we really wanted to see the Grand Palace (and tried several times). I actually wrote a post about the scam as well. In a way, though, I kind of feel like a part of pop-culture or history. I can say I experienced the infamous gem scam! I’m only glad for you in that you can warn people other people. This scam, and all the other ones prevalent in BKK, actually gives Thailand a bad name. And it’s been going on for ever…I fell for this in 1988!! But my friend and I were students and really really couldn’t afford to buy any gems so when we refused they got really nasty and basically left us in some out of the way place not on any map to fend for ourselves. Gone were the smiling tuktuk drivers. I can’t rememeber how we got back to where we where staying but it took ages and was pretty scary. It was my first day in SE Asia as a 20 year old and I fell for it totally. It’s amazing it’s still going on. Wow it has been going on for a long time. That is terrible that they were so mean though 🙁 Thankfully, there was nothing but smiles for us. The moment I read your first paragraph, I knew it was going to similar to what we had experienced while we were in Bangkok. We were walking towards the Grand Palace when somebody approached and introduced us as a teacher. Then we told us that the Grand Palace was closed for the day because of some ritual or something. Then he gave us some alternative of going to other places and a tuk tuk suddenly turned up from out of nowhere. Of course we would not be easily cheated and said no to his ‘kind offer’ of taking us around and that was when he turned angry. Of course we just shrugged off and laughed and walked on towards Grand Palace which was of course very much open. I just laugh at them now too! It’s amazing they have been able to get away with it for so long. Yep I got done too! It was in 1999 though! On my first trip to Bangkok. I got the bracelet home & had it valued, it was worth what I paid just – $950. They told me it would be worth $3000 in Australia. Either way it doesn’t matter, I’m not about to sell it. On a good note I found a brilliant jewellery in Hong Kong last year. I bought a lovely ring got it home & had it valued & its worth over twice as much! Brilliant, not that it matters either its my 10yr wedding anniversary gift & will never be sold! Thanks for your comment. It is very interesting to hear that the jewellery was valued at what you paid for it, so the scam is not as bad as I might have imagined! It is just a mean for the tuk tuk to get paid. I wanted to buy the ring and the pendant costing 70000B for my wife as gift. I thought it was of fair value. After reading the relevant websites I was worried that the jewellery is fake. I do not have time to authenticate the purchase. Next morning, I called 1155, lodged a report to the helpful tourist police who accompanied me back to the shop where I got a full refund. Thanks for those who contributed to these websites or else my wife would be wearing the jewellery which might be fake. Thailand Bangkok- got scammed for ferry/boat ride !!!! it’s not about how much you pay , it’s all about hurt you feeling later !!! Similar to the Grand Palace scam, the khlong scam is not as popular as it used to be as the khlongs are not what they used to be either. A friendly Thai man (he could be young or old) will approach you in the street, noticing your unmistakable lost look. He will ask the usual non intrusive questions: “where do you come from”. Those guys always have an anecdote about your country and always know a couple of sentences in your language… they also seem to know all the football players from every country, so if you are a football enthusiast, you just found yourself a buddy who will happily hit on that nail. The man will offer you to ride his friend’s longtail boat to go around the famous khlongs of Bangkok for a ridiculously low price (you know, the canals). It’s too nice to be true will you think (indeed) and the man is so friendly and he can even speak English! The tour is real and actually very nice so enjoy it. He is so kind he might even stop at a riverside bar and offer you a coke. So far so good, and as the ride is about to end you think how lucky you have been today! As you approach the pier, you are about to find out how lucky you really have been. The engine stops 200 m from the pier and your new friend will ask for an additional 1,000 baht – or more – for the cost of the boat ride. No matter what you say and how much you argue, the boat won’t get any closer to the pier. You will of course pay because they are two, the guy and the boat driver, and the idea of swimming back to the pier with your expensive camera and smartphone isn’t worth a thousand baht. Yup, it happened to me, too. The worst thing is that it happened to me during my third visit there and I knew everything about the scam. I was a guide to my 3 friends and we were stopped by this really nice gentleman. I don’t know why, but I believed him when he said the Palace was closed. Lol I am glad it is not just me and that you also had a positive experience overall! They are very good at what they do, that is for sure. I like your blog Sharon but I really don’t like this post. The Gem Scam in Bangkok has screwed over many tourists, many for big bucks, under the complicit eye of the Thai police. I fell victim to it way back in 2002 for the equivalent of $3000 and yes, I admit I was stupid. I posted about it and it continues to bring the most traffic and most comments to my blog. Why? Because to this day people are falling for this con and losing a lot of money. These people write me in a panic because many might not have done their research on Bangkok and they end up falling for it. So the tone and the comment that ‘sometimes getting scammed is a good thing’ is I think, to say it nicely, silly. Please keep in mind also that it is not just tourists being scammed but ordinary Thais who get caught in what is essentially a mafia-type operation. If you ever have a chance the scam is detailed in the show ‘Scam City’. Hmmm so because I enjoyed this experience I am silly? To put it nicely, I think you are being silly. Just because I enjoyed an experience does not make me responsible for people who fell for it and I definitely have nothing to do with Thais caught up in it. I agree with you, Frank! Scams should not be applauded…..they destroy tons of tourists’ vacations. It is a Mafia style scam organization and it rakes in millions for them while ripping off tourists. I’m concerned the “scams” will get bolder in the future and more menacing (as it is in Egypt already). Reminds me of the time I was waiting to leave Bangkok for one of the islands, I had a few hours to wait so I just hung out at the front of the airport watching people come and go. I wasn’t there long before a young woman nearby struck up conversation. She was friendly and said she was waiting for a plane also. It wasn’t long before she asked if I wanted to go into the city and enjoy the nightlife as we had a few hours to kill. If I’d been a testosterone fueled naive teenager I might well have gone for the adventure, I can only imagine what that would have entailed. Luckily my sense alarm bells rang and I graciously declined her offer, shame really but at 1am I shudder to think where I could have ended up and what I would have been missing after the experience. !Hi David! That is a scary thought. I bet it works all too easily with the right mark though! Hy David I don’t know why, but I am hundred and one percent sure that the lady you meet was a scammer. The way she wants you to come with her look fishy. At that point no girl really want to go with a stranger for fun. Scam is a scam, a fraud; they cheat us, no matter what type of fraud we fall. We lose everything, sometime money and sometime our loved ones. Right now, we are talking about this scam, yesterday night I read about pension scam. They just don’t care about who you are, your age, your circumstances. They just want to make money in a quick way. We can’t help each and every person in this world, but we can share this information with everyone. We didn’t pay anything to the original guy (I’m not totally stupid 🙂 ). The only people we paid was the tuk tuk driver (that was fair since the money wasn’t in that) and for the jewelry (which I have talked about above).